← Purdis news December 2018. Early big catch of moths at IGC. Been seeing a few Spring ushers this week round the security light at work so thought I’d give a trap a go. Was a bit breezy last night but luckily wasn’t too bad at my usual trap site in the woods. Pleased to find the trap had plenty of moths at rest around it this morning! 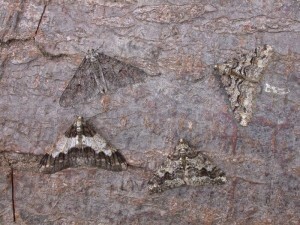 Most of the catch were Spring usher with a few Pale brindled beauty. Final count of Spring usher was 152, beating my previous best of 98 in January 2012 by some margin. There were also 8 Pale brindled beauty. Seems to follow on from the end of last year when there were very good counts of Mottled umber and Winter moth here. Really good mix of colour forms of the ushers, shown in the photo below. Addendum – Ran my 7w UV LED trap last night (15th) at the same location and beat the record again! 165 Spring usher caught this time, easily the best ever year for the species. My earliest ever record of Dotted border too. Not much else. Sadly with the cold weather now setting in the mothing will come to a halt.